If you are a college or university student, there is no more important goal than that of developing your mind, as everything you do in your life will be affected by your mind and how it operates. The quality of your learning is affected by the quality of your thinking about learning. The quality of your personal relationships is affected by the quality of your thinking about those relationships. To take command of the thinking that controls your life, you must cultivate your intellect. The guides in this set will help you get started. See also the bundle for College/University students. 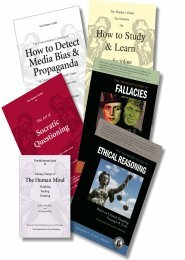 03SET College/University Student Supplemental Thinker’s Guide Set $71.95	 Qty.